All your book production needs at your fingertips. 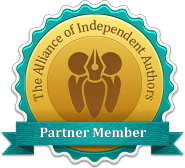 We have been vetted and approved as a recommended service by The Alliance of Independent Authors. ​AKGC Productions Media & Commerce Ltd.
Vine Leaves Press's Independent Publishing Assistance is a subsidiary of AKGC Productions Media & Commerce Ltd. Books produced by Independent Publishing Assistance will not be published under the Vine Leaves Press imprint. If you would like to be traditionally published by Vine Leaves Press, please visit their website and follow the submission guidelines.